Three thousand years ago about soy as a food product, have not heard anyone, even the Chinese. Nevertheless, they introduced the use of soyas the most available substitute for animal meat. Because soy is much more protein and calcium than natural meat and milk. The low carbohydrate content makes it one of the favorites in the diet. However, soy beans are indigestible for the stomach in General. In addition, the specific taste of soy beans. And cooked they are tough enough. 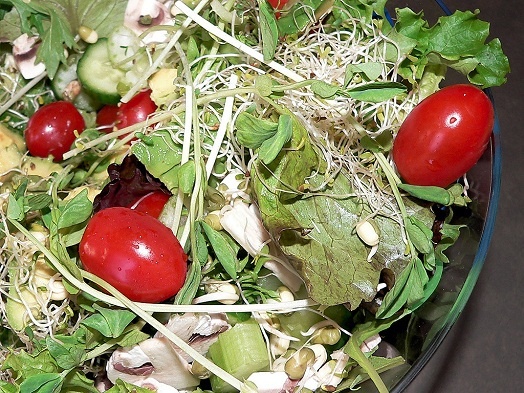 So often the food used sprouts or sprouted soybeans. You can buy soy in the store, but to grow it at home is much cheaper and healthier. Wash and soak the required quantity of soya beans for 6 hours in cold water. Take a clay or ceramic pot with a hole in the bottom. You can use ceramic pots. Lay on the bottom of a piece of cloth or filter paper. Put the soaked soybeans into the vessel, cover it from sunlight with a piece of cloth or filter paper. Water soy beans 2-3 times a day. In winter, do it lukewarm water. Keep in a warm place. Upon reaching the shoots length of 4-5 cm, separate them from semental and use in food. Germination of soybeans in the summer lasts about 3 days, in winter about 2 weeks. During germination of soybean protein soybean is split and forms an easily digestible substances. Soy sprouts have a pleasant taste, they can be fried, boiled, used to make salad raw. Before use should rinse the soybean sprouts in boiling water. Soy sprouts contain the entire set of amino acids, so necessary to man. Their use normalizes metabolism, lowers cholesterol, promotes proper function of the liver, improve brain function, alleviates irritability. Soy sprouts - useful and dietary product. They are rich in calcium, phosphorus and vitamin C. they contain fiber and minerals. Germ soybeans can be cooked a variety of dishes. 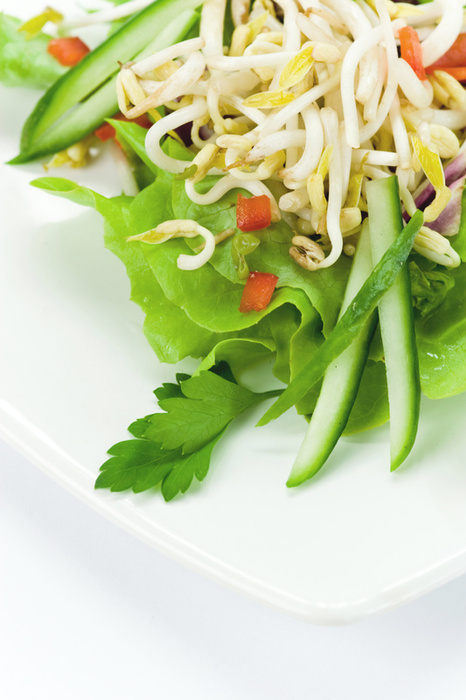 Chinese salad will satisfy lovers of spicy food. The bean sprouts thoroughly under running water and place in a container. Finely chop cabbage and carrot. Garlic skip through the press. Products put the bean sprouts and stir. Season with red crushed pepper and drizzle with lemon juice. Take the chicken, salt and pepper. Cut into strips and fry in vegetable oil or butter until tender. Mix with the remaining ingredients of the salad. Season with soy sauce or mayonnaise to taste. Add some variety to the usual recipe of vinaigrette. Boil until tender beets and potatoes. Cool, peel and dice it. Take the mushrooms, cucumber and onions. Slice and place other vegetables. The bean sprouts thoroughly. Mix all salad ingredients and season with mayonnaise or vegetable oil. Sprinkle with lemon juice or diluted with water citric acid. The dish is put on lettuce leaves and garnish with fresh herbs. Spicy salad sprouts soybean suitable for a light dinner. Potatoes wash, peel and boil in slightly salted water. Cool and cut circles. Beansprouts oblate boiling water. Prepare the sauce. To the water add vinegar, chopped onion and sugar. Add salt and pepper to taste. Put on fire and bring to a boil. Then pour prepared filling katiel and leave it for a while. Boiled eggs cut into circles. Mix with the prepared potatoes. Cucumber and apples peel and cut into slices. Soy sprouts finely chop. Combine all salad ingredients and season with vegetable oil. Mix thoroughly and garnish with fresh herbs. French salad - a light diet dish. Soy sprouts are put in a container and cover with cold water. Leave it for a while and drain. Chop the onion half rings and mix with the sprouts. Season the vegetable or olive oil. Add salt and pepper to taste.